Great with a banana costume! If film has anything to say about our future, we know that we should be treating our primate cousins with a little more respect. But, even without the experiments, we can watch as the amazing critters learn and adapt, ciphering out language and puzzles quicker than a number of adults that we’ve encountered. They have an astounding capacity for reason and nuanced personalities from one breed to the next. Yet, still, the Internet only gives us cats. Cat videos everywhere. You can sort of understand why they might want to host an uprising! 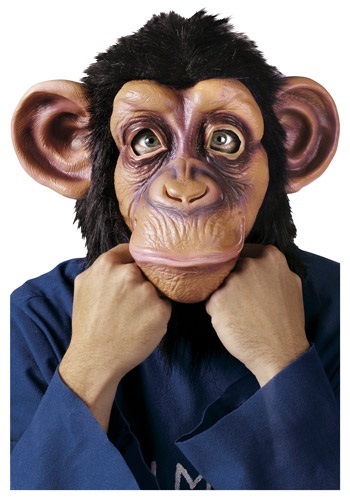 But, you can give the little monkeys the attention that they deserve by giving them some new visibility with this Deluxe Chimp Mask. This latex mask fits comfortably and has holes for your eyes… since vision can be helpful, we hear. The perfect compliment to an existing monkey costume or an entertaining one to go alongside a banana costume, you’ll make yourself the talk of the town in no time. Or, you can give the little guys the merit they deserve and give them an evolutionary upgrade with a suit. Mr. McMonkey, attorney at law?